Whether you've known me for fifteen minutes or fifteen years, you know two things about me: I love to eat, and I hate to cook. I mean, I HATE, with a white-hot passion...cooking. I've heard it said that I don't cook. Not true - I cook at least five nights a week. I just don't enjoy it. Nor, do I do it well. I simply cannot relate to people that love to cook. What's to love? Prep, assembly, making a mess, cleaning it up. All for twenty minutes of satisfaction? It's so much work. And the idea of coming up with a new dish every friggin day?! Plus, I have a crap hole kitchen with next-to-no counter space and no flow. I mean, would you cook here? My kitchen: Where culinary dreams go to die. If your answer was yes, feel free to come over ANY time. But since we are not Oprah, we can't hire a live-in chef, so I HAVE to cook. And since I love being fit, I have to cook healthy fare. So I'm officially in the "acceptance" stage of the seven stages of cooking depression. I need simple recipes. And I mean S-I-M-P-L-E. Don't give me that "only 20 minutes" crap, if you have to chop and sauté and prep for 45-minutes before you actually start cooking. Twenty minutes must equal twenty minutes, or I'm out. So, the other night, my hubby tells me he's craving meatloaf. I guess after 11 years of Monday chicken night, a guy gets bored. So I set out to make his meatloaf dreams come true, while staying healthy. I referred to my cookbook collection - my very dusty and rarely used, cookbook collection - and settled on Jessica Seinfeld's Deceptively Delicious and Monica Lynn's 5 Square Low Carb Meals cookbooks. Jessica is known for hiding veggies in her recipes so that kids will eat it but not know it's good for them. Monica is known for sucking all of the enjoyment right out of eating. I kid, sort-of. Monica's company provided the food for the fitness test group I was in last year. Thanks to Monica, I learned a lot about balanced nutrition. I still follow a 5-meal-a-day plan, and I still eat a relatively low-carb/low-sodium diet. It's what works for me, and how I've maintained my weight and size for nearly a year now. So I took a few ideas from Jessica's meatloaf recipe, a few from from Monica's, made some of my own tweaks, and voila! My first recipe! You'll notice, there's no added salt, no eggs, no breadcrumbs. You can thank Monica Lynn for that. It's a low-carb, low-sodium, low-fat meal. If you want real meatloaf, go to a diner. 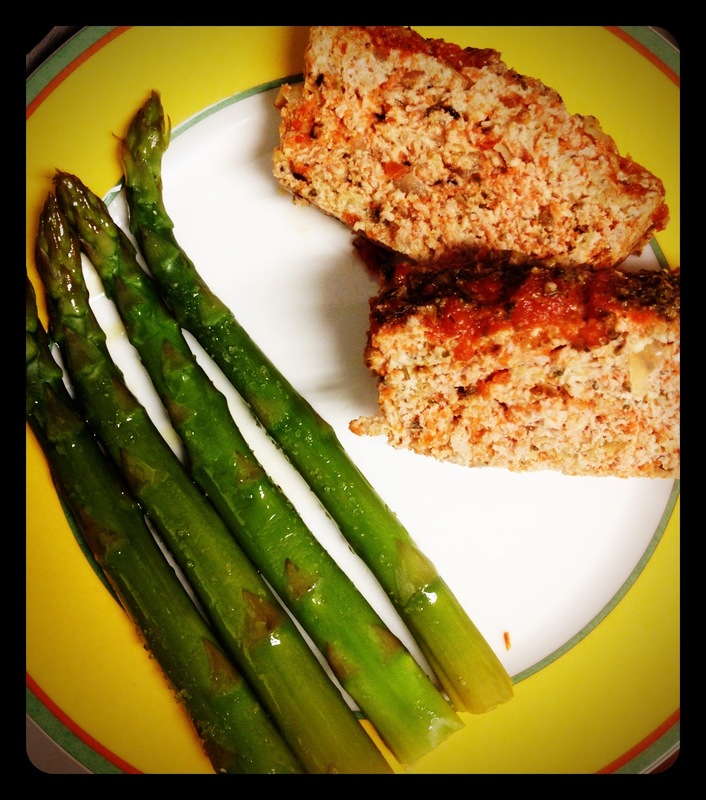 Formerly Fat Mom's healthier-than-regular-meatloaf Italian Meatloaf! Mix it all up, then dump it into a meatloaf pan. Remove from oven, then spoon 1/2 cup diced/crushed/chopped tomatoes on top. Sprinkle the remaining teaspoon of Italian seasoning onto the tomatoes. Cook for another 10 minutes at 375, then remove and let it cool. MANGIA! This one is all turkey breast, with carrot puree, topped with crushed tomatoes. Go crazy! It was bad enough that I made him eat protein, but the broccoli sent him right over the edge. The stomach truly is the fastest path to the heart.